"I have always been a bit sceptical about online courses, but my experience with this course proved me wrong." 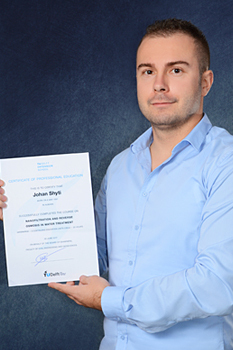 Johan Shyti is an online student from Albania. He enrolled in the online course Nanofiltration and Reverse Osmosis in Water Treatment in May 2017. Water technology is my passion. I started the course on a personal challenge to learn new things and advance in my career. To be honest, I have always been a bit sceptical about online courses, but my experience with Nanofiltration and Reverse Osmosis in Water Treatment proved me wrong. This was the course I had been waiting for several years to improve my knowledge of the latest techniques for water treatment – the sector I am most involved in. Lectures were very clear and the course provided a unique combination of scientific knowledge, virtual practice and appropriate techniques to design a water treatment system using reverse osmosis. The course helped me learn how to stick with a problem and find ways of solving it. Perhaps most significantly, this experience taught me the skills that will enable me to continue to develop my passion for the water sector beyond the virtual classroom. The online learning environment was very supportive, both promoting interaction with other professionals and at the same time learning independently. Thank you TU Delft for bringing into my modest Albanian home such innovative technology in the simplest way possible. You make it easy for anyone to study online. "This course had an excellent combination of in-depth theory, explanation and practical demonstrations."